You can leave a mark on a small town. The Cadillac Three just put out a new song for the new year. I love this time of year because we get so many new songs. There are new artists putting out new songs looking for breakthroughs. There are familiar artists putting out new songs hoping to build momentum. And then you have those acts still kind of looking for that first breakthrough. 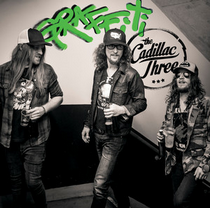 The Cadillac Three seems like it will breakthrough at some point with a huge hit. Maybe this one is it. This one has something a little different from these guys. Their previous singles have had a little more edge and that Southern Rock and Country thing that they’ve been working. People have loved that about them and I do too. I don’t know exactly what makes this one a little different. That edge is still there. It sounds cool and maybe this one is just really melodic and rolling. It kinds of takes you through this journey that these kid are living. They want to leave their mark on the world, but they’re right at the beginning of that journey and graffiti is their tool for now. So you have a few themes going on here. Kids wanting to break out into the world. And small town life where it’s really great and wonderful, but it can also feel like it’s holding some of the residents back. They want to go out and find something a little more. This is a cool song. It sounds different than what’s on radio right now, but I hope it can find a place with the mainstream audience.